"Cross the Floor" from the Joyce stables is looking very frisky. English horse "Shoot to Kill" is playing up, with jockey T Blair struggling to keep his mare under control. Blair has had a lot of trouble in foreign races lately, with "Dossier" causing massive problems in the Middle East two years ago. She is now in, and ready to go. "No Debate" and "A Nation Distracted" are off to a great start but "Our Democracy" missed the start badly and is at the back of the field. 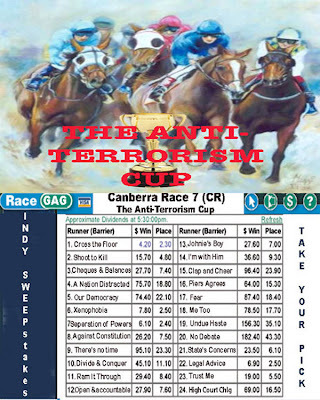 "Xenophobia" ridden by Pauline Hanson has settled to the front of the field. "Fear" ridden by veteran hoop John Stone is also up near the front. "Against the Constitution" ridden by Peter Beatie is also making a strong showing. "There's no time" is three wide. "Divide and Conquer" has been steered into a good position by John Howard as he chases his fifth cup. "Me Too" ridden by Kim Beazley is settling in just behind "Divide and Conquer". And as we pass the post for the first time, "Open and accountable" has settled towards the back of the field. "No Debate" still leads by a head, but here comes "Johnie's Boy" ridden by Mick Keelty. "I'm with Him" ridden by Alan Jones is now making himself heard, and his large group of fans are sure to be happy about that. And "Xenophobia" now makes her move. "Clap and Cheer" with Andrew Bolt in the saddle is just behind "Xenophobia". "Clap and Cheer"'s stablemate "Piers Agrees" is also in the running. "Seperation of Powers" is well and truly boxed in by "Ram It Through" and "Undue Haste". "Cheques and Balances" ridden by Petro Georgio started strongly but is now dropping back in the field. The pace is now picking up in the back straight with "State's Concerns" and "Legal Advice" making their move, but it's still "Shoot to Kill" and "No Debate" leading the field. "Our Democracy" and "Open and Accountable" continue to fall behind and "I'm still here" ridden by Lyne Allison is also struggling. Coming into the home straight, horses are eight wide with "Trust Me" ridden by P Ruddock holding a slight lead. "Fear", "Xenophobia" and "Ram it through" are in great position. They are being pushed hard by "Clap and Cheer", "Piers Agrees" and "I'm With Him". "Seperaration of Powers" is gone and so is "Me Too". There has bean a dreadful fall at the back of the field with three horses going down. I think it's "Our Democracy", "Open and Accountable" and "Public Consultation". 400 out, and here comes "Shoot to Kill" and "No Debate". "There's No Time" is flying down the outside. And here comes "A Nation Distracted". Two hundred out and it's anyone's race. "I'm with him" ridden by Alan Jones has been dragged to the extreme right of the track Alan Jones opening up a huge hole for "Divide and Conquer". "Clap and Cheer" and "Pier's Agrees" continue to block "Sensible Debate" against the rails. Foreign raider "Shoot to Kill" has sprouted wings down the outside and we could see more of him later. "High Court Challenge" has been severely checked by "Trust Me" and the stewards will definitely be looking at that incident. It's "Shoot to Kill" leading, but here comes the great stayer "Divide and Conquer". "A Nation Distracted" and "Fear" are pushing "Divide and Conquer" forward. "Shoot to Kill", and "A Nation Distracted" are battling it out. IT'S NECK AND NECK. "Shoot to Kill", "Divide and Conquer" and "A Nation Distracted". It's close. AND HERE COMES "CROSS THE FLOOR" FROM NOWHERE. IT'S A FOUR WAY PHOTO FINISH. The race that doesn't stop the nation is too close to call. A four way photo and a steward's appeal by "High Court Challenge" mean the final result won't be known for a while. Constitution: Defending Against State Terror and Despots Australia has no major laws that are not derivatives of English Law and all of our major laws rely on British court precedents for interpretation and implementation. These laws and our Constitutional Monarchy system create a situation where, even if Howard and all State Premiers vote unanimously on the Anti-Terrorist laws, and every ALP/Dem/Lib/Nat/Green party hack also votes unanimously on their laws, and even if such laws are given Royal Assent, those laws are still void.